As we see in the Photography Market report, overall confidence in the Modern and Contemporary Photography market decreased by 8% since the last reading in May 2014. 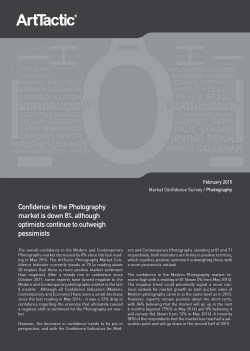 The ArtTactic Photography Market Confidence Indicator currently stands at 75. (A reading above 50 implies that there is more positive market sentiment than negative). After a steady rise in confidence since October 2011, some experts have turned negative to the Modern and Contemporary photography market in the last 8 months. Confidence Indicators (Modern, Contemporary and Economic) have seen a small decrease since the last reading in May 2014. It was a 22% drop in confidence regarding the economy that ultimately caused a negative shift in sentiment for the Photography art market. However, the decrease in confidence needs to be put in perspective. With the Confidence Indicators for Modern and Contemporary Photography standing at 81 and 71 respectively, both indicators are firmly in positive territory. This signifies positive sentiment outweighing those with a more pessimistic outlook.